Maybe you have fallen behind in your mortgage or car payments. Maybe you have way too much credit card debt, or huge medical bills. Maybe you haven’t paid your income taxes. Whatever the exact problem, you are now at the end of your rope, and you need help. Nobody wants to file bankruptcy, but it is often the only way to protect you and your family’s well-being. Will you ever manage to pay off your credit cards, or will you instead simply pay thousands of dollars in interest charges, year after year and never be debt free? Bankruptcy is often the only way to achieve a final, lasting solution to your debt problems, get a fresh start and move on with your life. Look over the information I provide on this website. You will notice it’s different from other bankruptcy law firms websites. For one thing, I don’t overload you with lengthy, boring discussions of bankruptcy law. You can be assured that after over 25 years and handling thousands of bankruptcy cases in Jacksonville, Florida, I have the knowledge and experience to analyze your problem and recommend the best course of action for you. But I can only do this after I personally talk to you, in my office or by phone. 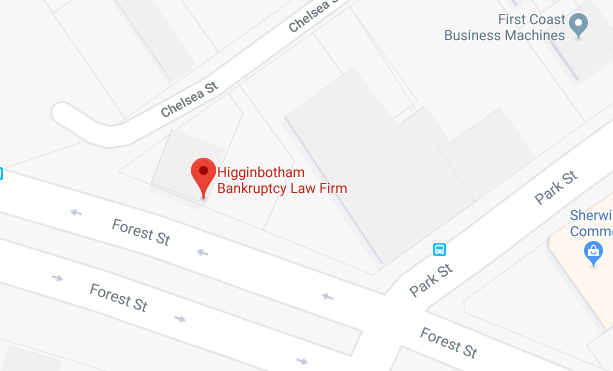 Call the Higginbotham Bankruptcy Law Firm at 904-354-6604 now to set up your free consultation.